Note: This article was originally published in 2014. Besides the growing number of Washington Wineries (960 to now well over 1000) having to edited this article rings true. Wine is the answer, What was the question? Wine is more than a liquid libation. 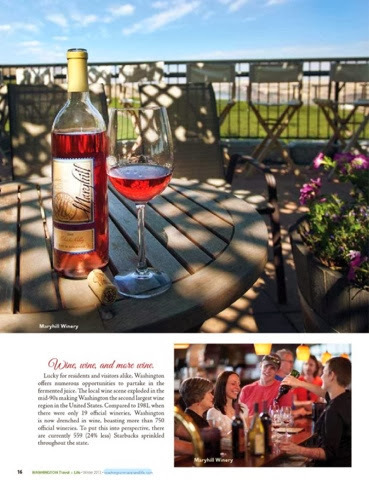 Most locapours (lovers of local wine) will claim Washington wine has meaning, depth and even truth in every glass. Wine is an experience, sometimes even a ritual that’s meant to be shared and from there the truth often flows. Vino Veritas is a Latin phrase that translates "in wine [there is the] truth." Wine, wine, and more wine. 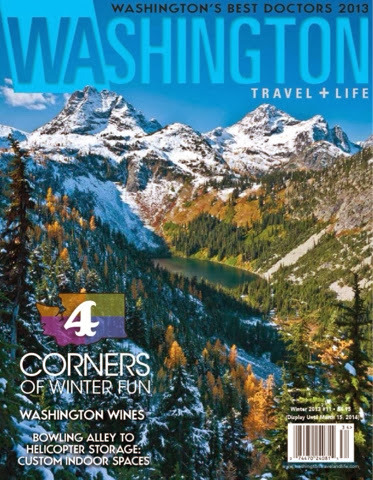 Lucky for residents and visitors alike, Washington has numerous opportunities to partake in the fermented juice. The local wine scene exploded in the mid 90s making Washington the second largest wine region in the United States. Compared to 1981, when there were only 19 official wineries, Washington State is now drenched in wine boasting more than 1000 official wineries. To put this into perceptive, there are currently 757 (20% less) Starbucks sprinkled throughout Washington. Wine has a story. With the onslaught of wine production comes the stories behind the wine that are ultimately expressed in your glass. From the people who work the vineyards to the winemakers, even seemingly little decisions all have an impact on the direction, outcome and personality that consumers taste. The range of possible combinations of these factors can result in vast differences among wines and influence the fermentation, finishing, and aging processes. Though winemaking sounds très romantique, if you venture in you’d better be more than just passionate about it. Most winemakers will tell you that being in the wine business requires hard work and even more money. Not to burst the view from your rosé colored glasses but we have it on good authority that winemaking involves a massive amount of cleaning. Wine can convey history. Wine has a rich history dating back thousands of years and each vintage tells a tale about that specific year. You may have heard wine enthusiasts refer to terroir [ter-wahr], the French word for land. Terroir can be loosely translated as "a sense of place," which is embodied in certain characteristic qualities. This combination of factors including soil, climate, and environment give wine its distinctive character. In a vertical tasting, different vintages of the same wine type from the same vineyard are tasted. This emphasizes differences between various vintages. Explore what makes a "good year," and you can learn a lot about a particular wine. The specific conditions under which the grapes were grown and harvested also impact how the finished product tastes. Temperature fluctuations and the amount of rain or sunshine affect grape varieties differently. When it’s decided that harvest commences and extraordinary occurrences like extreme weather or insect swarms also leave their mark. Craig Leuthold, owner of Maryhill Winery says weather isn’t as much of a factor, especially in Eastern Washington, but rather his concern is the composition of the soil and who is tending to the vineyard. 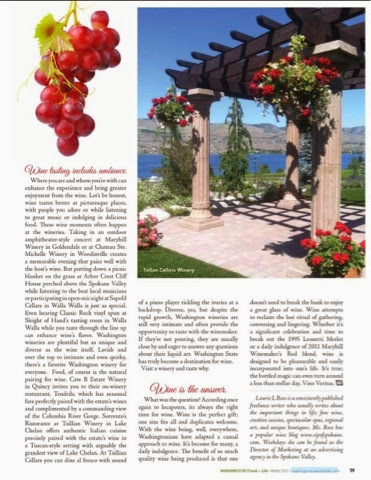 Washington State has been recognized as having ideal geography and conditions for growing premium vinifera wine grapes. The state claims on average 16 hours per day of sunshine and annual rainfall of eight inches (20.32 cm) in Eastern Washington (the major grape growing region) and 48 inches (121.92 cm) in Western Washington. The 350+ grape growers in Washington focus on Riesling, Chardonnay, Cabernet Sauvignon, Merlot and Syrah, but the region officially produces over 30 varieties of white and red wines. Wine tasting includes ambience. Where you are and whom you’re with can enhance the experience and bring greater enjoyment from the wine. Let’s be honest, wine tastes better at picturesque places, with people you adore or while listening to great music or indulging in delicious food. These wine moments often happen at the wineries. Taking in an outdoor amphitheater-style concert at Maryhill Winery in Goldendale or at Chateau Ste. Michelle Winery in Woodinville creates a memorable evening that pairs well with the host’s wine. 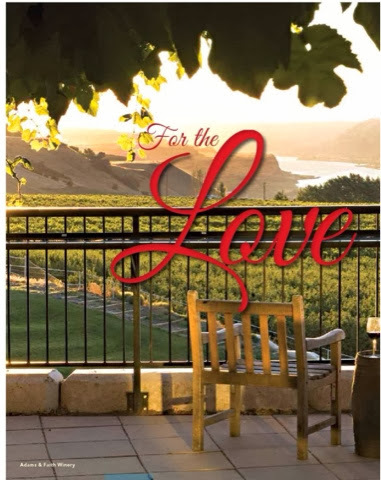 But putting down a picnic blanket on the grass at Arbor Crest Cliff house perched above the Spokane Valley while listening to the best local musicians or participating in open-mic night at Sapolil Cellars in Walla Walla is just as special. Even hearing Classic Rock vinyl spun at Sleight of Hand’s tasting room in Walla Walla while you taste through the line up can enhance wine’s flavor. 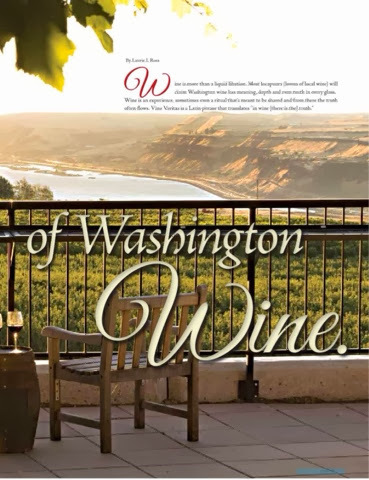 Washington wineries are plentiful but as unique and diverse as the wine itself. Lavish and over the top to intimate and even quirky, there’s a favorite Washington winery for everyone. Food, of course is the natural pairing for wine. 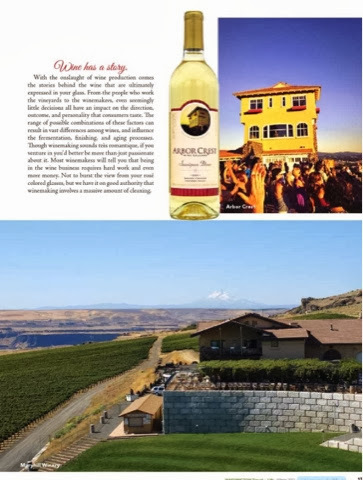 Cave B Estate Winery in Quincy invites you to their on-winery restaurant, Tendrils, which has seasonal fare perfectly paired with the estate’s wines and complimented by a commanding view of the Columbia River Gorge. 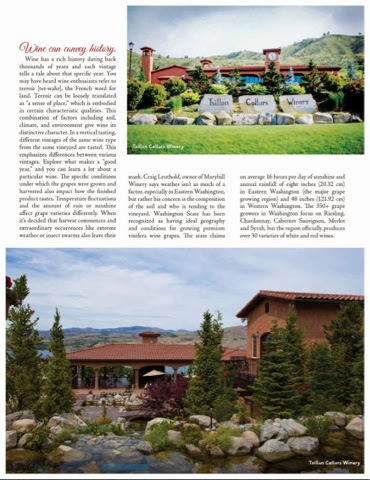 Sorrento’s Ristorante at Tsillian Winery in Lake Chelan offers authentic Italian cuisine precisely paired with the estate’s wine in a Tuscan style setting with arguably the grandest view of Lake Chelan. At Tsillian Cellars you can dine al fresco with sound of a piano player tickling the ivories at a backdrop. Diverse, yes, but despite the rapid growth, Washington wineries are still very intimate and often provide the opportunity to taste with the winemaker. If they’re not pouring they are usually close by and eager to answer any questions about their liquid art. Washington State has truly become a destination for wine. Visit a winery and taste why. Wine is the answer. What was the question? According once again to locapours, its always the right time for wine. Wine is the perfect gift; one size fits all and duplicates welcome. With the wine being, well, everywhere, Washingtonians have adapted a casual approach to wine. It’s become for many, a daily indulgence. The benefit of so much quality wine being produced is that one doesn’t need to break the bank to enjoy a great glass of wine. Wine attempts to reclaim the lost ritual of gathering, conversing and lingering. Whether it’s a significant celebration and time to break out the 1995 Leonetti Merlot or a daily indulgence of 2011 Maryhill Winemaker’s Red blend, wine is designed to be pleasurable and easily incorporated into one’s life. It’s true; the bottled magic can even turn around a less than stellar day. Vino Veritas. Laurie L Allen is a consistently published freelance writer who usually writes about the important things in life; fine wine, creative cuisine, spectacular spas, regional art, and unique boutiques. Allen has a popular wine blog www.sipofspokane.com. Weekdays she can be found as a Washington state Realtor.